When it comes to colonizing Mars, he's seriously skeptical. 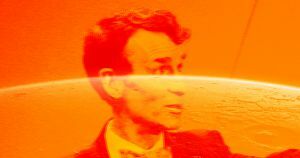 Bill Nye thinks you’d have to be on drugs to believe Mars could ever be habitable for humans. Nye is a respected science communicator, so his opinion on the viability of Mars terraforming plans carries some weight. He also has some pretty solid arguments. Nye isn’t alone in his thinking, either — noted astrophysicist Neil deGrasse Tyson, another well-known science advocate, also believes any plans to make Mars livable for humans are absurd. However, the pro-terraforming camp isn’t all slouches — it counts among its membership SpaceX CEO Elon Musk and late physicist Stephen Hawking. In Musk and Hawking’s opinions, we can and should exhaust all options for transforming Mars into something of an Earth 2.0. And they have some pretty compelling reasons, ranging from climate change to the notion that becoming an interplanetary species is the next step in human exploration. While Nye really couldn’t have been more clear about his opinion on terraforming Mars in the USA TODAY interview, he did also say he believes we should send astronauts to explore the Red Planet. And who knows? Maybe they’ll find something there that moves the Science Guy from the camp of the terraforming skeptics to that of the believers.